Most design problems involving analog circuits require a great deal of creativity to solve. But, as the authors of this groundbreaking guide demonstrate, finding solutions to most analog signal processing problems does not have to be that difficult. Analog Signal Processing presents an original, five-step, design-oriented approach to solving analog signal processing problems using standard ICs as building blocks. Unlike most authors who prescribe a "bottom-up" approach, Professors Pallás-Areny and Webster cast design problems first in functional terms and then develop possible solutions using available ICs, focusing on circuit performance rather than internal structure. The five steps of their approach move from signal classification, definition of desired functions, and description of analog domain conversions to error classification and error analysis. 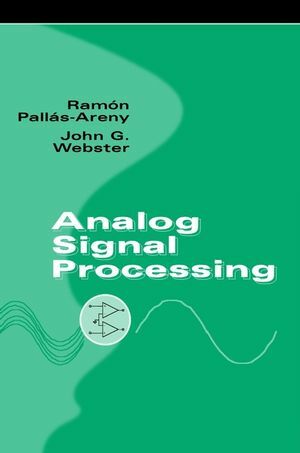 Featuring 90 worked examples-many of them drawn from actual implementations-and more than 130 skill-building chapter-end problems, Analog Signal Processing is both a valuable working resource for practicing design engineers and a textbook for advanced courses in electronic instrumentation design. RAMÓN PALLÁS-ARENY, PhD, is a professor in the Electronic Engineering Department of the Polytechnic University of Catalonia in Barcelona, Spain. JOHN G. WEBSTER, PhD, is a professor in the Department of Electrical and Computer Engineering at the University of Wisconsin-Madison. Analog Signal Switching, Multiplexing and Sampling. Noise, Drift and Their Reduction.